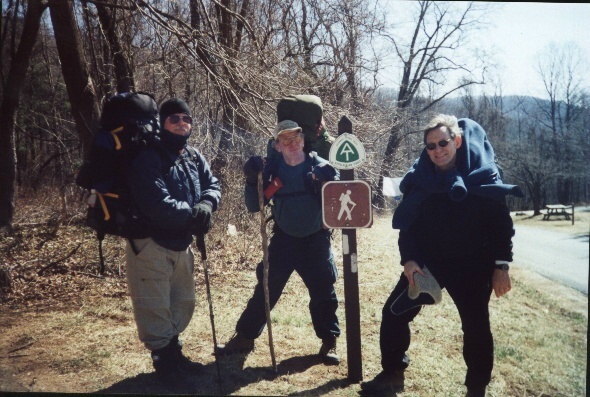 3/10/2001- Rob Moody and I started out around 5:15AM for the long trek from Manassas, VA to Buena Vista, VA to meet Charlie Johnson and Bill Isham for a 2 day, 21.7 mile backpacking trip along the AT between US60 and US501. We made great time, getting to Buena Vista a little after 8AM. We had a decent breakfast at the Hardee's in Buena Vista and waited for Bill and Charlie. They arrived promptly at 8:30AM, the assigned meeting time. We talked while they ate breakfast and then shuttled the cars to the southern trailhead. Charlie suggested that we hike this one from north to south as the easy downs were at the beginning and end of the hike. I'm glad that we did as this would turn out to be a tough hike. We also had a tough time finding the southern trailhead as they relocated the trail since I reconned this area the previous fall. We got the cars placed at each end and began the hike around 11AM, an hour later than I had hoped to. This would come back to bite us. 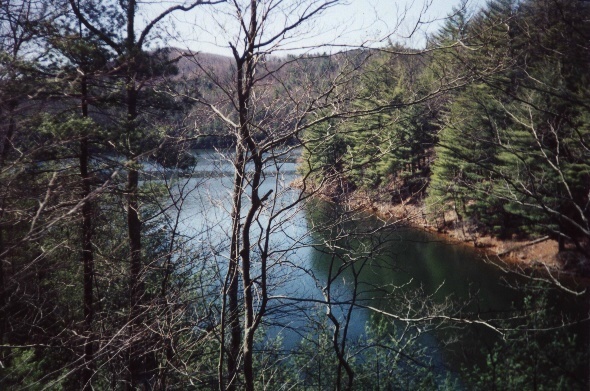 The trail from US60 south to the Lynchburg Reservoir was a very pleasant slightly down hill trek. This would be a great day hike if one car were placed at US60 and the other at the dam parking lot. 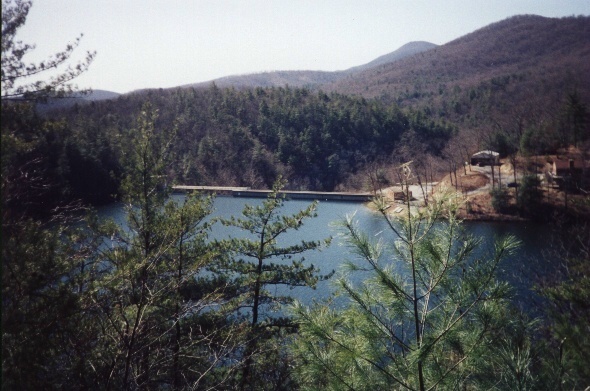 The reservoir and dam were very pretty sites. We did the 6 easy miles to the dam and arrived around 1ish. Then we started a grueling 4 mile up along Rice Mountain. Not having done any serious hiking since last October, I was hurting while doing this up. We got to VA 607 around 5:30, the Blue Ridge Parkway around 6PM and the Punchbowl Shelter, our goal for the day, around 6:30PM. The weather had gone from cold when we started the hike to pleasant during the day to getting very cold by sundown. We were now battling not only the impending darkness but the cold as well. So we frantically put up our tents, ate and went to bed. Rob bivied in the shelter while the rest of us tented near by. This was an old but nice shelter with a pond nearby. I was in my sleeping bag and asleep by 8PM. 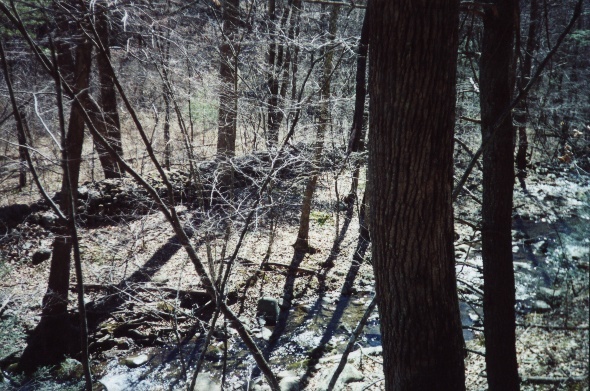 3/11/2001- We all slept fairly well that night since we were dog tired from the 4 mile up. But today would prove to be even more strenuous. We awoke around 6:30, ate and hit the trail. The weather was perfect. It was about 40 degrees at sunup. Then it would hit 60 by the end of the day. We immediately did a 2 mile up & down over Punchbowl Mountain. No problem. Then we faced another 2 mile up over 3300 foot Bluff Mountain. This was a tough up. And it got cold on the way up. I had to put my long sleeved shirt back on. We had some great views from Bluff Mountain. Then we had a big down, then some blips, then a final up with more great views. We saw the James River from up on Big Rocky Row. Then we had a 2.5 mile down to John's Hollow Shelter. Since we were tired, we did not stop there. We then had some slight ups and downs, a nice stream bed hike and finally got to our car. We were very tired after this one. Being out of shape as well as this being the first hike of the year contributed to this. But we all agreed that this hike was a challenge, we conquered it, we saw some great scenery and enjoyed each other's company. This was a tough hike but is highly recommended for the experienced backpacker. Stone wall at Brown Mtn. Creek.